What can parents do when the “light goes out of a child’s eyes” in a traditional school setting? Debbie Steinberg Kuntz, the founder of the Bright and Quirky Child Summit, spoke with Bridges Academy High School Director Dr. Chris Wiebe about when parents understand their child may need a change in learning environment. 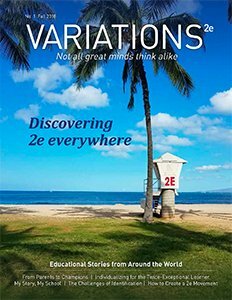 Wiebe, who is also the managing editor of 2e News, talks about establishing trust, using humor to set students and families at ease, and how a strength-based approach can support a student not only in areas of interest but in all academic areas. This year’s summit runs for seven days, beginning January 28. Content will be FREE to the public each day for 24 hours. There will be approximately 4-5 talks per day. An All Access Pass is available for purchase for those who would like to watch the series at their own pace. All Access Pass holders can also opt in for a free three-month trial of The IdeaLab, an online 2e support and learning community, where parents and summit experts can interact on an ongoing basis. Bridges Academy is a private school in Los Angeles that exclusively caters to a twice-exceptional population. Several members of the Bridges family — including Bridges 2e Center Director Dr. Susan Baum and Bridges trustee Dr. Robin Schader — are among the speakers at this year’s summit. Presenters also include Dr. Ross Greene, Dr. Laura Kastner, Dr. Dan Siegel, Dr. Temple Grandin, Dr. Ned Hallowell, Michelle Garcia Winner, Dr. Barry Prizant, Dr. Denise Pope, Dr. Laura Markham, Dr. Dan Peters, and many other experts in the field. Click here for more information on this year’s Bright and Quirky Child Summit.